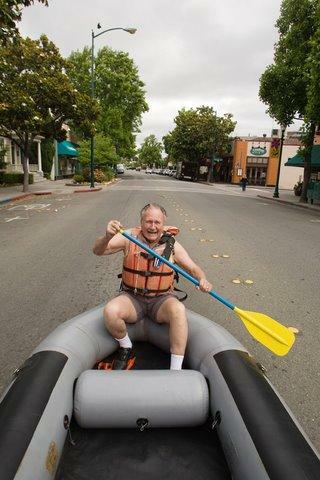 George Armstrong, Founder and Owner of All Outdoors rafting Co. came to Walnut Creek way back in 1953. At that time, there was a train coming through town, there was no freeway and Ygnacio Valley Rd was a “skinny little two lane road” according to Armstrong…. Raising his 5 kids here with his wife Dolores, they sold Christmas trees in town for 25 years, using various vacant lots around town. “Taco Bell, Big 5, Safeway and Target were all open spots back then where we used to sell our trees“ He says . . . With his family, they started conducting backpacking, rock climbing, bicycling and rafting trips with all the children helping in the preparation and conducting of the trips. “family and friends.” What a family it is! Nowadays more than 10,000 people annually go on All Outdoors rafting trips on 10 different rivers in California, making them the largest outfitter in Northern CA. Armstrong, at age 83, is still guiding and his love for Walnut Creek is evident. “Walnut Creek to me has been a real good mixed – middle of the road – community with great schools“. His favorite place to grab a meal in town?